I'm not a milk drinker at all. I've never been one. Nearly 3 years ago, Izzy was diagnosed as lactose intolerant and I made the switch to Silk. I didn't even know it existed until then and now I'm never going back to regular milk. Now, I'm not saying there isn't regular (cow) milk in the house - there is. I just don't drink it and neither does Izzy. We prefer Silk. I like that Silk comes sweetened and unsweetened. I also like how versatile it is. I use it with my granola, in my coffee, and add it to recipes. 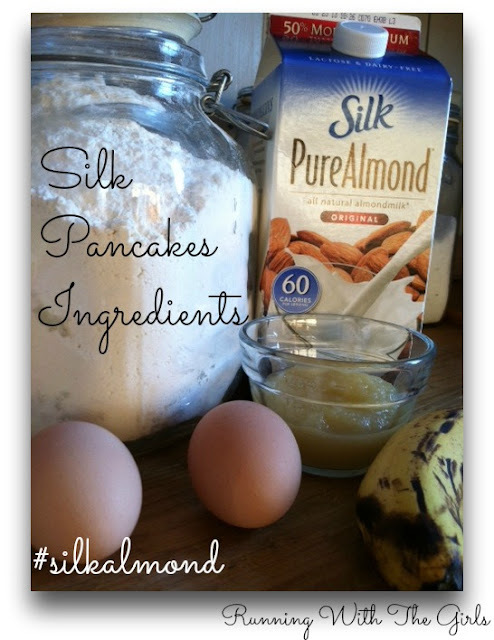 Silk has a variety of delicious recipes you can find on their facebook page. One breakfast favorite in our house is pancakes. They are incredibly easy to make and it's easy to change up the ingredients if you are low on something or want to use something up. Pancakes are a big hit with the family as well. They want to eat them morning, noon, and night, so I can never go wrong with pancakes. The other day, I wanted something sweet but healthy, so I created my own pancake mix with Silk and a brown banana I wanted to use. I thought the applesauce and banana would sweeten the mix enough, but I needed just a little more sweetness added to my pancake mixture, so I added in some raw sugar. I am sure you can add any kind of sweetener you have on hand. I just happened to have raw sugar sitting out on my counter, so that's what I used. Then serve with your favorite toppings. Sometimes I use honey on my pancakes but most of the time I use pure maple syrup. For dinner the other night, I lighted up my homemade mac 'n cheese by adding in Silk. I also had some ham in the refrigerator I needed to use, so I added that to the mac n' cheese as well. End result: absolutely delicious! *Every time I make homemade mac 'n cheese, I use a different combination of cheeses. I like a variety of cheeses and I love the way different combinations change up a regular dish. This past time I chose sharp cheddar, monterey jack and parmesan. All of the cheese I use are blocks of cheese that I grate just before using. But that's just me. - In a saucepan, melt butter, add in Silk and cheese. Heat on low. Watch closely and stir often. - Cut up ham into cubes, add a smidge of olive oil to a pan to heat up the ham. I like it slightly browned. 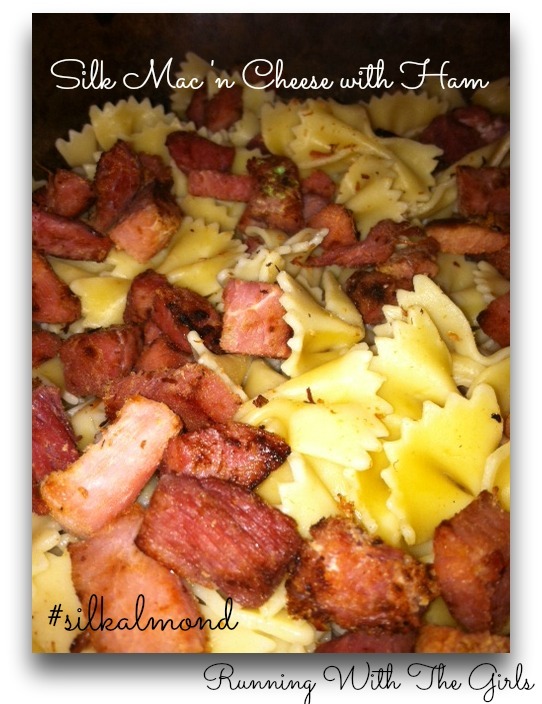 - Pour drained pasta into baking dish, add ham, pour melted cheese/Silk mixture on top. Stir slightly. - Bake for 20 to 30 minutes until cheese bubbles and browns a bit. We tried soy milk once and I didn't care for it. I think it was more a mental thing than anything else for this long-time milk lover. I love almonds though, so the almond Silk sounds pretty good. I just might have to try it! Since we ran out of syrup and it's so freaking expensive, I started using agave nectar that I had on hand for syrup on pancakes. So yummy! I am a huge fan of Silk Almond milk - especially the dark chocolate! I'm definitely going to check out those FB recipes! 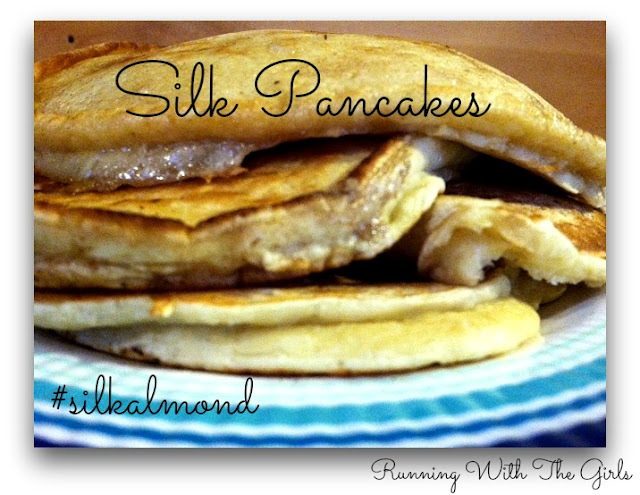 I love Silk Almond Milk and these are both great recipes to use it in. I love the idea of mixing the dry ingredients ahead of time and whipping up a few pancakes at anytime. Yum! I love it too! I don't drink regular milk, I was lactose intolerant for awhile when I was younger and then I "grew out of it" (I think I still have sensitivity to dairy, though). Silk Almond Milk is the bomb. Your recipes look so simple yet so divine! Yummy! both of these recipes look great! I love almond milk too and was thrilled that my friend just sent me a coupon for a free container of Silk. Going to pick it up tomorrow! Nice review, Jen, and great looking pancakes, too. Never had soy milk, but don't care for any milk so I usually only have it in recipes. FYI - mac n cheese recipes don't really work well with preshredded cheese because of the coating they put on it to keep it from sticking together in the bag so your block/shred way is best. I'm sure I'd love your pancakes. Bananas are the bomb! I love almond milk! I use it every day in my morning smoothies. That pasta looks amazing!!! I love Silk and Almond milk. I have used it in pancakes and I completely agree about how versatile pancakes are....you can change up most things as long as you have the balance of dry and wet ingredients :) YUM nice recipes! Silk milk is a staple at our house! It's been a favorite of ours for a couple of years.